Experience several adventures in one on this multifaceted tour from Cancun. 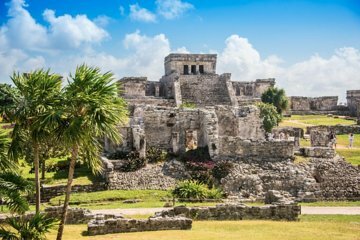 First, visit the ancient Mayan ruins in Tulum, which are set against a dramatic backdrop of ocean bluffs and Caribbean Sea. Then switch into adventure gear for a thrilling ride through the jungle on an ATV. Finally, cool off in a refreshing cenote filled with geological formations. Your private guide is on hand all day to answer questions about the local history and lifestyle. Despite heavy rain at Tulum our guide did her best to make this a very fun day. At the cenote and cave the owner/operator went out of his way to ensure we were satisfied with our experience. The cave tour was breathtaking. And the younger members of our group loved their mudfests with the ATVs. Our tour guide at Tulum was very knowledgeable, unfortunately it was raining hard and we couldn’t do as much as we would have liked. Our adventures with Hidden Treasures was amazing. Our teenagers loved the ATV’s. The Cenote cave was one of the most beautiful experiences I have had. We were able to swim through the cave and get up close to the stalactites and stalagmites. Tulum was amazing. The atv and cenote were so much fun!! Thank you to the guides. We will definitely be back! Had a great experience with this tour company! They seem to be a smaller copmany compared to the copmanies with the fancy brochures at our resort. This was evident in the check in process. A little disorganized and some staff didn't speak english. However, despite my initital reservations, our group had a wonderful time! The tour guides were amazing especially the folks who guided us through the cenote and the atv's Luis. Friendly, patient, and customer focused. We really felt that they went out of their way to make sure we had a good time. Thank you for the wonderful trip! We had so much fun. The tour guides were great!!! ATV and cenite was the best. Highly recommended!!! This entire experience was amazing and very well put together. They arrived promptly at our hotel and transported us as promised. Our tour guide was very knowledgeable (and funny). The cenote and Mayan ruins had me at a loss for words. Finishing the day on ATVs through the jungle, it didn’t get much better than that!! This was worth every penny and definitely plan to use this company again in the future! Great transportation service, guide and tour in Tulum. ATV’s and Cenote tour was amazing! It’s a must in Cancun! Family loved it, but the food was not good at all. I would of have it 5 starts if the food was good, but unfortunately it wasn’t. Overall the tour and service was amazing. My kids did the Cenote cave tour and loved it. It's a little claustrophobic so I skipped it. We all had a blast on the ATV's and we did see another cenote. The staff was terrific! Very friendly and helpful! Highly recommended!